The Spotted Sandpiper is the most widespread breeding sandpiper in North America, ranging coast to coast across the northern half of the continent. It reaches the southern limit of that range in Tennessee, where just a few pairs breed in scattered locations across the state. It is much more common in Tennessee during spring and fall migration when individuals can be found at the edge of just about any type of water body including lakes, ponds, rivers, and streams. Rather than traveling in large flocks like most shorebirds, the Spotted Sandpiper migrates singly or in small groups on its way between the breeding grounds and the wintering grounds that extend from the extreme southern U.S. to southern South America. Description: Both the constant tail-bobbing and stiff shallow wing beats make this medium-sized sandpiper easy to identify. In spring and summer the white breast and belly have distinct black spots, the back is brown with faint black bars, and the bill is orange with a black tip. During the non-breeding season the back is duller and the underparts are plain white with some brown extending down the sides of the breast. In all plumages there is a thin white eye-stripe, a faint eye-ring, and a brown rump and tail. The sexes are alike in plumage, but females are larger. Solitary Sandpipers occasionally bob their tail, but they are slightly larger, have a prominent white eye-ring, but no white eye-stripe. The back is a more grayish brown and has white spots. Habitat: Breeding territories are in a variety of habitats, but include semi-open upland with dense patches of vegetation and usually contain some shoreline. During migration Spotted Sandpipers can be found on the shoreline of rivers, lakes, streams, or ponds. Diet: Aquatic and terrestrial invertebrates. Nesting and reproduction: Spotted Sandpipers are unusual among birds in that the female is the one that establishes and defends the territory. She will court and breed with several males, and the males are responsible for incubating and raising the young. One female may lay eggs for up to four different males in one season. Incubation: The male incubates for about 3 weeks. Fledging: The young leave the nest soon after hatching, and the male will tend them for another 3 weeks. Nest: The nest is a shallow depression lined with dead grass and some woody stems, and usually built under shading vegetation on the ground near water. 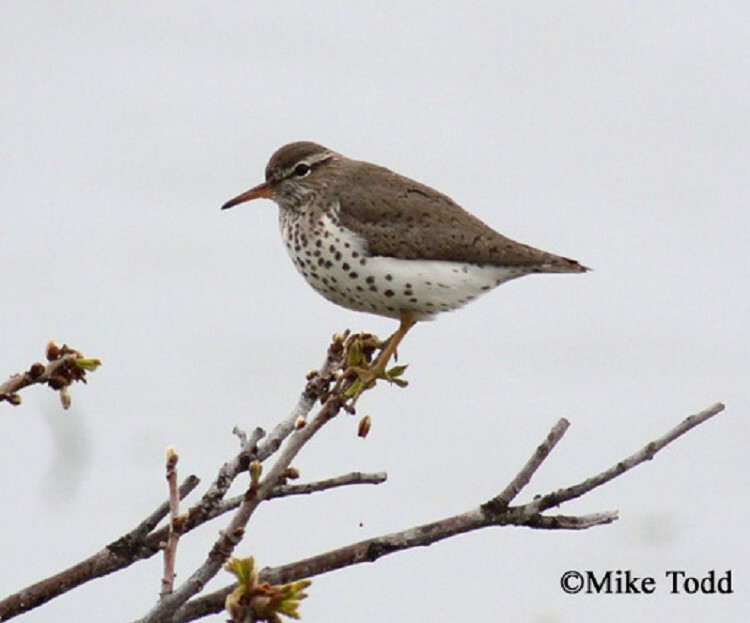 Status in Tennessee: The Spotted Sandpiper is a fairly common migrant, and a rare summer and winter resident in the state. During migration it can be found along the banks of streams, rivers, lakes, and ponds from mid-April through late May, and then again from late July through September. Breeding and wintering birds can be found in scattered locations across the state. One female can mate with up to 4 males in one season. She is also able to store sperm for up to one month, so the eggs she lays for one male may have been fathered by a different male from a previous mating. The function of the bobbing motion typical of this species has not been determined. Chicks start bobbing soon after hatching. Best places to see in Tennessee: During spring migration (mid-April to late May) and fall migration (late July through September) Spotted Sandpipers can be found on the shoreline of lakes, ponds, rivers, and streams across the state. Oring, L. W., E. M. Gray, and J. M. Reed. 1997. Spotted Sandpiper (Actitis macularia). The Birds of North America, No. 289 (A. Poole and F. Gill, eds.). The Academy of Natural Sciences, Philadelphia, PA, and The American Ornthologists' Union, Washington, D.C.